A very kind woman whom I had only recently met brought me a hostess gift which was a basket of Bob’s Red Mill gluten free cake mixes. It was lovely of her to be considerate of my allergies, and I appreciated her thoughtfulness. Now for true confessions: I hold a prejudice against a majority of cake mixes. They have too much sugar, use the the worst type of flour with no protein or fiber, and usually are not very tasty, in my opinion. I will admit that some of that is changing. I have seen whole grain cake mixes on the market, as well as mixes claiming to have less sugar. I will also concede that using a cake mix when you are rushed for time will shave off five to ten minutes of prep time, and the convenience of that can be worthwhile to folks. I decided to make the best of the situation, because as strong as my prejudice is, stronger still are my feelings about wasting anything. My family will tell you that I will turn leftovers into new meal after meal until every morsel is gone, rather than throw food out. So, I assessed the Bob’s Red Mill Vanilla Yellow Cake mix to see what I could do. I could not change the sugar content or the lack of fiber and protein, but I could make sure not to add any more sugars than needed. 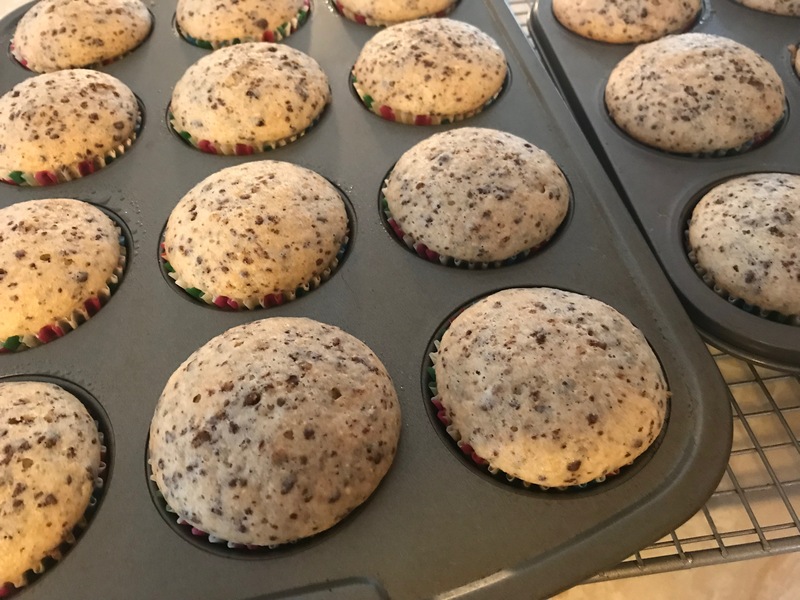 I decided, therefore, to make cupcakes with no frosting, but I would need to jazz up the flavor if there was not going to be frosting. To do so, I zooped uncrystallized candied ginger with Enjoy Life chocolate chunks and mixed that in with the cake mix, along with some orange zest. While the candied ginger and chocolate chunks still had sugar, it would be much less than using frosting. Once I figured out the flavors, I needed to think about the ingredients I needed to add to the mix. The recipe called for 3 eggs. I opted to use 1/2 cup of egg whites with one whole egg. It also called for melted butter or vegetable oil. I chose to substitute extra light olive oil. When the cupcakes were done and cooled, I have to say I was not unduly upset with the result. It was still a cake mix batter with too much sugar and no protein or fiber, but it was tastier, and I had added a good fat and reduced some of the bad fat and calories. Also, as my husband is quick to point out, indulging in something not as good for you every once in a while usually will not hurt you. Preheat the oven to 325 degrees and line 18 muffin cups with cupcake liners. In a food processor, zoop the candied ginger and the chocolate chunks several minutes into very small pieces. In a large mixing bowl, mix together the cake mix and the ginger/chocolate pieces, adding the dried orange peel. Add the egg whites, egg, oil, and water, and using a mixer, blend slowly at first until all the ingredients are incorporated. Then on a higher speed, mix the batter for a minute or so until it’s thick and well mixed. Cool in the tins for about five minutes. Then remove them to a wire cooling rack to completely cool.